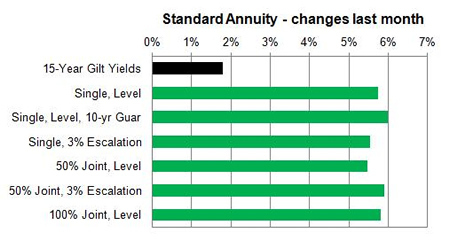 Providers of pension annuities have increase rates by over 5% as the 15-year gilt yields continue to rise with investors expecting higher inflation and interest rates from the US Fed. There was another strong performance with annuity rates higher by over 5% for the month of November following investor expectation of higher inflation and a sell off of government debt pushing gilt yields higher. Providers have greater margin and are more competitive with Canada Life, Aviva, Hodge Lifetime and Legal & General raising their rates to match Just Retirement. The 15-year gilt yields increased to their highest level since Brexit of 1.79% up 18 basis points. Standard providers increase rates by an average of 5.76% and we would expect in the medium term of six months rates may increase further by 0.12%. For smoker and enhanced annuity providers increased their rates by an average of 4.78% on average and in the medium term of six months rates may increase by 2.09%. For the month of November 100% of annuity rates increased by up to 8.3% as providers are now more aggressive at increasing rates with 0% decreasing 0% remaining unchanged. Standard annuities increased by an average of 5.76% during the month. For those aged 75 rates were higher by 8.3% on a single with 10 year guarantee basis and 7.6% with no guaranteed period. No annuity rates decreased. For enhanced and smoker providers rates increased by an average of 4.78% with a larger rise of 6.8% for those aged 55 buying single life, 3% escalating annuities. 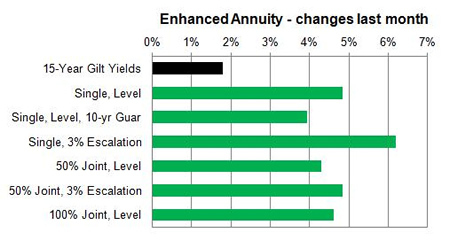 No annuity rates decreased.